When Katie told us she likes to be the one who keeps everything running smoothly and efficiently, we knew we’d found a good match for our accounting and office assistant position. Katie joined us in 2017 to fulfill these vital roles. Katie reconciles our financial accounting, and provides marketing support and office administration. She also greets visitors, takes incoming calls, and assists with special projects aimed at adding value to our client experience. 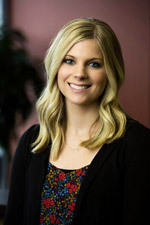 Before joining Grand Wealth Management, Katie served in accounting positions at various Grand Rapids businesses, plus she holds a bachelor’s degree in finance. Her combination of academic and professional experience makes her a particularly good fit for her role here at Grand. Katie currently works for us part-time while she raises her two young children. This doesn’t leave an enormous amount of time for other activities, but when she does take a break, she enjoys settling in with a good book, or going boating with family and friends from their lakeside family cottage.